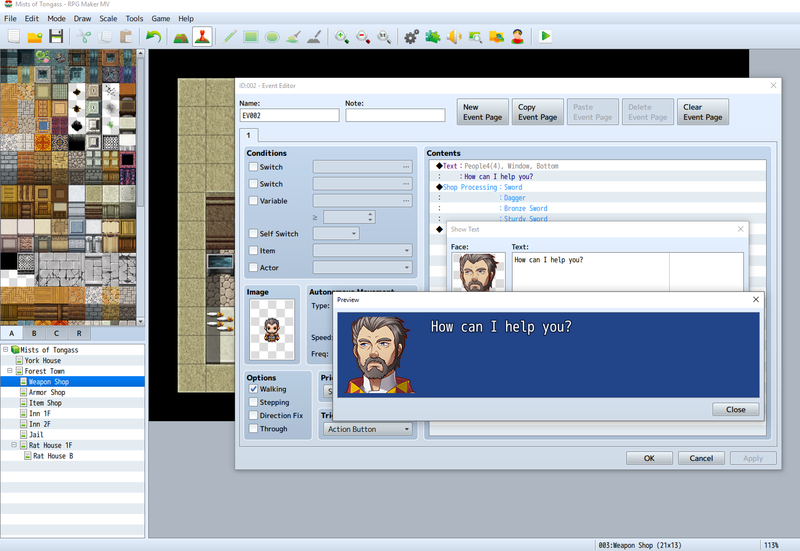 In Part VI of our exploration of RPG Maker MV, we set up our hero Lucius York’s first mission, created a level (house+basement), and filled it with enemy encounters. We set up conditions for completing the mission and its reward. In this installment, we’ll slow things down a bit and set up stores where our hero can purchase items and equipment for future missions. 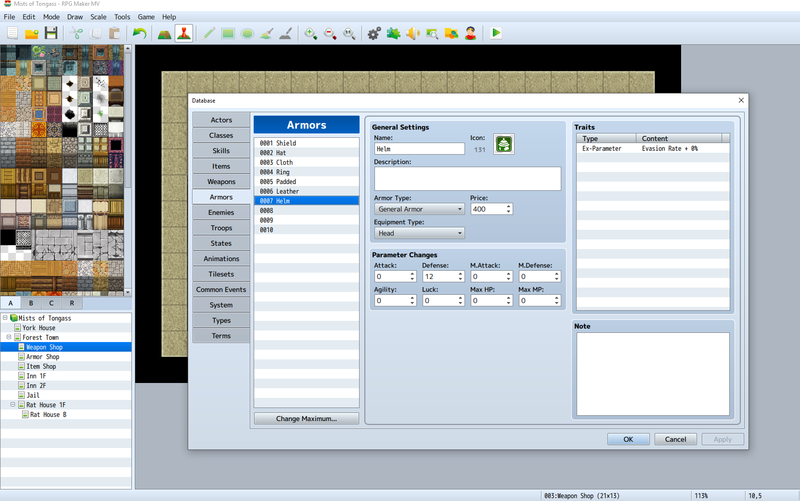 RPG Maker allows players to control several heroes, or “Actors.” Each actor can be assigned a different class, and each class can be specialized with different weapons, armor, and skills. Our game only has one actor, so far, and we’ve already edited his class to be able to equip both swords and daggers. So the stores in our town should be stocked with weapons and armor our hero can use. This requires creating a few beyond the default that came with the program. To get started, load the Database Editor (gears icon) and go to the Weapons tab. The maximum number of weapons should have already been changed to 10. We added the Rusty Knife in Part VI. Now we’re going to add a few more weapons, each slightly more powerful (and expensive) than the last. I added three new weapons: Dagger, Bronze Sword, and Sturdy Sword. The Dagger’s Weapon Type is Dagger (obviously). The swords are Swords. This is all self explanatory, but it’s important for the Weapon Type to match the Weapon Types your actors are allowed to equip, otherwise your store will be offering products the player can’t use. I gave the Dagger an attack value of 9 and price of 200, the Bronze Sword an attack value of 12 and price of 600, and the Sturdy Sword an attack value of 15 and price of 800. This is because RPG Maker already comes with a Sword with an attack value of 10 and price of 500 as a default option. The default items are much more expensive than I prefer, but it’s fine for just learning the basics. Now click on the Armors tab. There are already a few default items, two of which Lucius York should already be wearing: Hat and Cloth. Like weapons, armor can also be assigned to different types and restricted by user class. Unlike weapons, armor has an Equipment Type: Shield, Head, Body, and Accessory. An actor can only be wearing these four types of armor at any given time. I added three new pieces of armor: Padded (body), Leather (body), and Helm (head). Padded armor increases defense by 12 and costs 400, Leather armor increases defense by 14 and costs 500, and Helm increases defense by 12 and costs 400. Keep in mind both weapons and armor can increase Attack, Defense, Magic Attack, Magic Defense, Agility, Luck, Max Hit Points, and Max Magic Points. They can also be assigned various traits that add a resistance percentage to poison, for example. Items are a little more complicated because there are more factors. Items can be consumable, have a scope (to whom and how many it applies), Occasion (when do you use it), and Invocation (what action it performs). 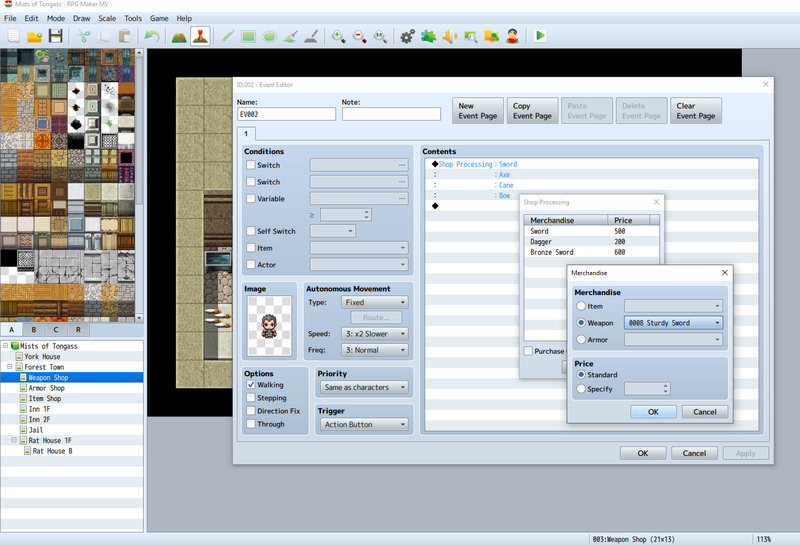 RPG Maker comes with four default items: Potion (heals damage), Magic Water (recovers Magic Points), Dispel Herb (cures poison, confusion, etc. ), and Stimulant (recovers from knockout). These are fine for our Item Shop. 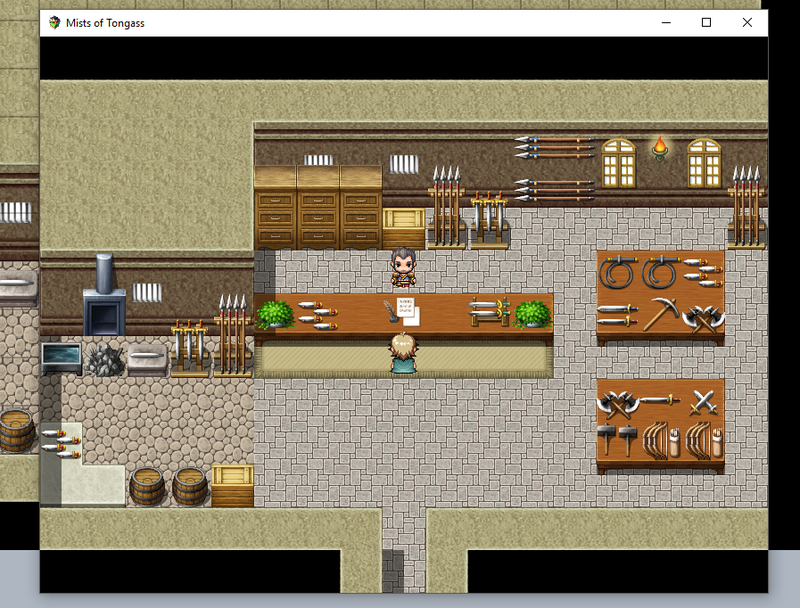 RPG Maker makes creating a shop easy. We already loaded three shop interior maps for our game Mists of Tongass. All you need to do is place a shopkeeper behind the counter, just like we did with the other villagers. Write an identical greeting for each shopkeep, or customize it a bit. Simply display text saying something along the lines of, “Can I help you?” Then, beneath that command, in Tab 3 under Scene Control, insert “Shop Processing.” Double click an empty line to add an item, weapon, or armor for sale. 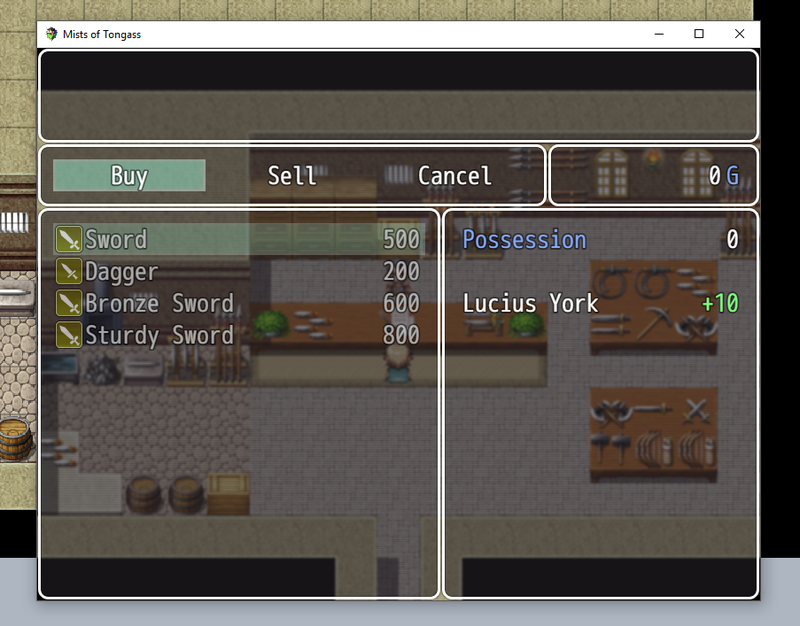 Shops are setup by default to allow a player to sell equipment as well as buy it. To disable selling, just check the box that says “Purchase Only.” You can also change the price of each item in that particular store, if you want them to be more expensive in a town where an item is rare, for example. Finally, make sure the Autonomous Movement type is “Fixed,” unless you want your hero to chase after the shopkeep. That’s it! Pretty simple, huh? In our next installment, we’ll be designing our final mission, which will earn Lucius enough gold to finally pay off his grandpa’s debts and spring him from debtor’s prison.